There are a number of ways to enliven your landscapes, and in this watercolour of a farm in the English Lake District I have employed a few devices to add interest. A clothes line can be used to add colour and by not having the clothes hanging straight down you can give them a sense of being blown about – white, pink and red are excellent colours to use on the clothes. Just in front of the house I have emphasised blossom on the trees, and many of the trees around the house are bright green, adding to the feeling of spring and further drawing attention to the centre of interest, which is the house. However, once you include figures the centre of interest will then transfer to them, unless they are extremely small. The cyclists were not present, but I added them to bring life into the work. Always try and get your figures to be doing something, rather than standing around with their hands in their pockets, and for this try introducing some prop like a wheel-barrow, bucket, or as in this case, bikes. Finally, remember that sunshine will always liven up a painting. 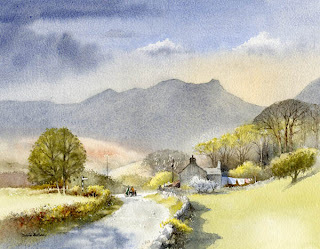 This entry was posted in David Bellamy, watercolour landscape painting by David Bellamy. Bookmark the permalink.